WordPress is the most popular CMS in the world and now powers more than a quarter of the websites across the globe. Launched in 2003, WordPress began as an open source blog publishing platform that has grown significantly in scope and breadth. Popular sites using WordPress include WTOP, Forbes, Whitehouse.gov, TechCrunch, Vogue Magazine, The New Yorker, BBC America, Bloomberg Professional, The New York Times Company, Facebook Newsroom, MTV, The Walt Disney Company and the Official Star Wars Blog. See more on the WordPress Showcase. For many of the reasons laid out below, WordPress is an ideal CMS for professional publications and media, nonprofits, trade associations, government, education institutions, and corporate sites. WordPress is a great CMS for beginners, as well as non-technical content managers and writers. WordPress is known for is its easy-to-use content management interface and its intuitive, fast development process, making it a popular choice for web designers and content managers alike. A relatively low startup cost and quick expected time to launch also make WordPress popular with management and leadership. Writers, editors, and site administrators can contribute to a WordPress site with no HTML or coding experience thanks to a self-contained WYSIWYG (What You See is What You Get) editor. WordPress’ WYSIWYG interface allows for writing, editing, and adding content as easily as in a Word document. It is also simple and quick to add images, links, and new pages. This browser-based platform allows multiple users simultaneous access for editing the site from any computer, a useful tool for a large organization. More than 75% of Americans now own smartphones and regularly use them to access websites. WordPress themes are easily optimized for smaller devices like smartphones, meaning the site is responsive for different screen sizes and fully adaptive in order to make use of touch features. Our implementation of WordPress includes tools designed to optimize the site content. Search engines love our WordPress sites because we include relevant meta tags, sitemap XML, and microformats. When paired with a strong content strategy, these features will get you to the top of search rankings every time. WordPress sites are completely customizable and can include a large variety of plugins like an event calendar, image galleries, and a live Twitter feed. They also include tools like OptinMonster to grow your email subscribers, Google Analytics to track users, and Yoast SEO to maximize the site for search engines. Other tools are included to insert headers/footers and slideshow galleries, FAQ pages, and much more. Is a Technical Background Required? Definitely not. WordPress is optimized to be easy to use for content managers, writers, editors, and company leadership. WPjarvis.com – A quick search interface for website administrators. OptinMonster – Allows you to convert website visitors into email subscribers. MonsterInsights – An excellent plugin for connecting your site to Google Analytics. Gravity Forms – Quickly create embedded contact forms with multiple fields. Advance Custom Fields – Use this to take full control of your WordPress edit screens & custom field data. Redirection – Monitor URLs across your site and build redirects to ensure all expected URLs go to the right content. YoastSEO – An excellent plugin to optimize your site’s SEO to increase rankings on Google and Bing. Apache Solr, a powerful tool for in-site searches and a crucial component of any good website, can be integrated into the WordPress backend easily. This integration capability is a powerful selling point for WordPress. With Solr, both high and low-traffic sites with large databases can be slowed down by poor search functions that create a bottleneck. Apache Solr enables complex searches by indexing attachments (like pdfs) and providing fast and accurate results. 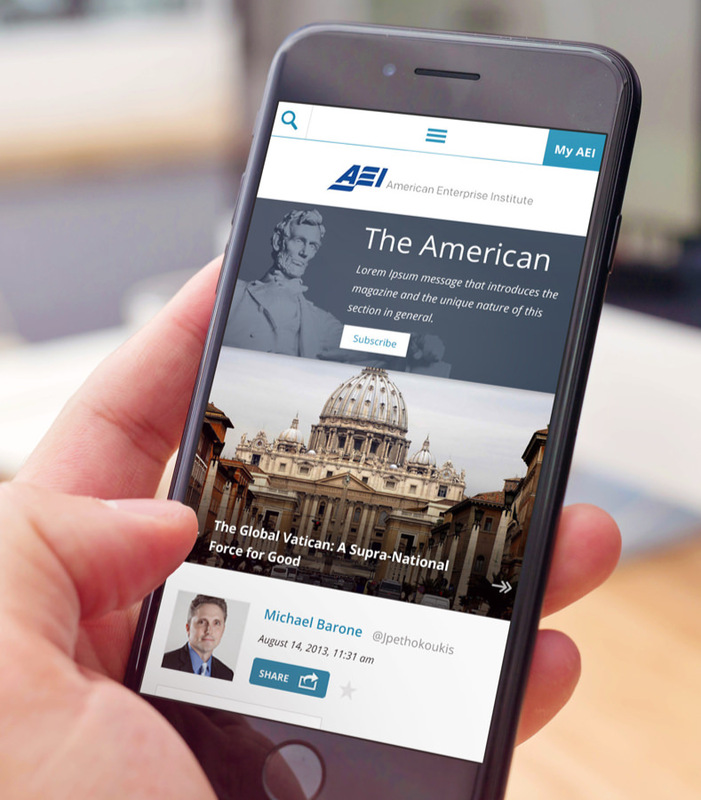 For the American Enterprise Institute, we used Apache Solr to improve the user experience for searching through AEI’s broad scope of publications. WordPress is highly flexible and allows for integration with third-party APIs (application programming interface) as well as the creation of your own API endpoints. An API allows you to communicate from server to server in order to exchange information such as published content, user information, or rich media. WordPress also makes SSO (Single Sign-On) with other systems simple using OAuth like Google Apps or a SAML-based integration like Salesforce. SSO allows a user to use one login across multiple sites without sharing your password across these sites. Essentially, you can log in to one site and be authenticated to access many different sites without needing to log in to each one. APIs and SSO are critical to making your website work seamlessly with popular third-party platforms like SalesForce and Netforum. For the Flight Safety Foundation, we integrated Salesforce for members-only content and advertising. Our work also included integrating Swiftype for in-site search functionality. WDG built a custom flexible layout system for sites that need a specialized framework and want to work within the WordPress CMS. Sections and landing pages are built with WDG’s flexible layout framework, using custom-designed rows of elements as “building blocks” for each page. This custom layout can be reused and reordered to create unique, brand-consistent templates that include flexible components like columns, accordions, sliders, grids, tabs, galleries, quotes, and images. It also includes WordPress Editor, header, and breadcrumb and/or navigation menu options. WDG has created additional layouts depending on the content needs of each project. Ultimately, building flexible content layouts into the WordPress CMS extends the longevity of the build in order to meet ongoing, yet-to-be-identified needs. It also becomes a cost-effective option to build within, rather than deploying additional standalone properties that will need to be designed, deployed, managed, and maintained. WordPress also has the ability to “run headless,” meaning you can publish content to WordPress’ powerful tools and see it as a notification on an entity like an Apple Watch or billboard. This provides additional flexibility by incorporating new functionalities which support WordPress’ status as a leading CMS. WordPress has plugins like All-in-One WP Migration to ensure a smooth and successful content migration from your old site to your new one. Moving all content by hand poses a big risk for errors, lost pages, and content, as well as a lack of continuity following the migration. WordPress allows for simple and thorough migrations that have been tested across multiple hosts and operating systems. For the American Enterprise Institute, WDG migrated a huge amount of content from four different sources into one WordPress site, streamlining the user experience by bringing all of the resources into one place. WordPress 4.8, released in the summer of 2017, has several new features, including all new media widgets and an image widget that allows you to drag and drop images with ease. The new video widget allows you to easily embed videos from YouTube and Vimeo, while the new audio widget will let you add an audio file to your WordPress site in order to incorporate music, podcasts, or any other audio media you wish. An updated text editor allows easy additions and formatting changes to content. News and events widget will let you easily integrate relevant content on upcoming conferences or breaking news for your viewers. Open source software has its source code available with a license in which the copyright holder provides the rights to study, change, and distribute the software to anyone, for any purpose. Open source software may be developed in a collaborative, public manner and is the future of development for several reasons. One key advantage of open source software lies in the sheer volume of its members. With so many people contributing to the platform, problems can be quickly and efficiently fixed through a wide variety of insights, methods, and abilities. Web Developers have created modules and plugins for nearly every possible need. Proprietary software, on the other hand, often gets buggy and is riddled with rigid or outdated command philosophies. With open source, you can continually adapt to create the best product possible. With more than a 28% of all websites now using WordPress, it has the largest CMS user community in the world. There are over a billion sites now using WordPress and about 50,000 plugins now available. The developer community for WordPress is also growing and there many user groups that can assist with questions, problems, and bug fixes. Large hosting providers are investing millions to web hosting infrastructures to power some of the world’s largest WordPress websites. When exploring WordPress, consider hosting providers such as Blackmesh.com, WordPress VIP, and Pantheon. The average cost for a WordPress build is about $50k-$75k for medium-sized websites and $75k -$500k for large enterprise websites. WordPress is the most popular website in the world for good reason. It is by far the best choice for those new to website content management and development. It is easy to use and requires almost no technical expertise as a content manager. It is the best choice for small to medium sized websites, corporate websites, and blogs. Like Drupal, it is an open source platform and has a large user community and thousands of plugins available for nearly every website need.